This is an extraordinary love story of Claire and Henry who met when Claire was six and Henry was thirty-six, and were married when Claire was twenty-two and Henry thirty. Impossible but true, because Henry suffers from a rare condition where his genetic clock periodically resets and he finds himself pulled suddenly into his past or future. In the face of this force whcih they can neither prevent nor control, Henry and Claire's struggle to lead normal lives is both intensely moving and entirely unforgettable. Claire: It's hard being left behind. I wait for henry, not knowing where he is, wondering if he's okay. It's hard to be the one who stays. I keep myself busy. Time goes faster that way. I go to sleep alone, and wake up alone. I take walks. I work until I'm tired. I watch the wind play with the trash that's been under the snow all winter. Everything seems simple until you think about it. Why is love intensified by absence? This book tells the story of Henry DeTamble, a librarian in Chicago and his wife Claire Abshire, who is an artist. Henry has a rare genetic disorder (Chrono-Displacement) that causes him to travel through time involuntarily. In the opening of the novel, when 28 year old Henry meets 20 year old Claire, he has no idea who she is although she has known him her entire life. Weird much? It just gets weirder. Henry begins his time traveling at the age of five, jumping forward and backward in his timeline. Where he goes, when he goes, and how long he goes is never in his control. He could be doing an everyday task like brushing his teeth and he would suddenly find himself with a 12 year old Claire. Most often he travels to places and times related to his history. He goes jogging to remain calm and stay in the present. Henry cannot carry anything with him during his sudden travels so he always arrives naked and then struggles to find food, clothes and shelter. The Time Traveler's Wife follows the story of their lives mostly in a straightforward chronology, at least from Claire's perspective. She's a child and then a teenager with their secret rendezvous throughout the years in the meadow. Henry first visited her at an older age, so he knew the dates that the earlier versions of himself would visit the older versions of Claire (Its confusing I know.. but keep up!) She kept clothes hidden for him in the meadow and sometimes hid him in a basement room of her house. He was her big secret that she always kept to herself. How could she explain the presence of an older man who traveled through time to be with her? During another visit, he inadvertently reveals that they will be married in the future. Over time they develop a close relationship. Claire is last visited in her youth by Henry in 1989, on her eighteenth birthday, during which they make love for the first time. They are then separated for two years until their meeting at the library - which is the 'actual meeting' when both of them are in the present. 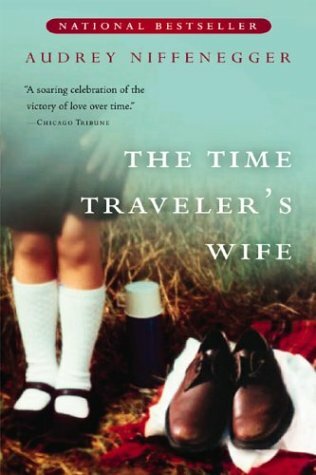 At its heart, and a very big heart at that, The Time Traveler's Wife is a love story, one populated by realistic characters. Even with the time travel and its effects on their lives, Henry and Claire are people you intimately know and empathize with, their fears and flaws common to us all. Even through their rough stretches of their life, the lifelong fear of something terrible happening to Henry while time traveling, their anguish at the miscarriages when Claire wants a baby more than anything else, the moments where they'd just rather be alone, their love for each other is never questioned and their hope is never extinguished. Henry plans carefully and worries often during potentially stressful situations, like his wedding to Claire or meeting her family for the first time. It also adds to the suspense of the story, not knowing when Henry will arrive or leave during any important part of their life together. You kind of start to guess where the story is headed when finally Henry and Claire finally have a daughter, Alba. Alba is diagnosed with Chrono-Displacement as well but, unlike Henry, she has some control over her destinations when she time travels. Before she is born, Henry travels to the future and meets his ten-year-old daughter on a school field trip and learns that he died when she was five years old. Once you're buried within this novel and fully immersed in their lives, you have to suffer their pain - the knowledge that they know Henry is going to die, as well as celebrate their joys with Henry and Claire. When he is 43, during what is to be his last year of life, Henry time travels to a Chicago parking garage on a frigid winter night where he is unable to find shelter. As a result of the hypothermia and frostbite he suffers, his feet are amputated when he returns to the present. Henry and Claire both know that without the ability to run and escape when he time travels, Henry will certainly die within his next few jumps. On New Year's Eve 2006 Henry time travels into the middle of the Michigan woods in 1984 and is accidentally shot by Claire's brother, a scene foreshadowed earlier in the novel. Henry returns to the present and dies in Claire's arms. Claire is devastated by Henry's death. She later finds a letter from Henry asking her to "stop waiting" for him, but which describes a moment in her future when she will see him again. The last scene in the book takes place when Claire is 82 years old and Henry is 43. She is waiting for Henry, as she has done most of her life, and when he arrives they clasp each other for what may or may not be the last time. I was about to start this book!!! I have seen the movie and absolutely moved by the love story! This is an absolute delight. I enjoyed the movie so much that i thought i will definitely buy the book, but somehow always forgot. And now i have to download the movie ASAP ~! I have been thinking of buying this@@ So i m gifting this to myself on christmas because I m totally engrossed by the review you have given.. I haven't watched the movie yet! Its a good book. I haven't seen the movie though! Yeah, I heard a lot about it too but never got around to reading it. Finally picked it up in the airport while waiting for my flight!